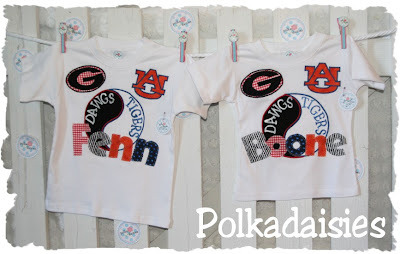 This is what happens when you can't pick just one team...you have to have a Polkadaisies' shirt with both on it! Oh my goodness... those are so awesome! You've outdone yourself! Becky~ You outdid yourself on this one! :) :) LOVE IT! Thank you both! I struggled with these shirts and spent more time than usual on them, but I was pleased with how they turned out. Beth helped with the idea of the ying yang, so hats off to you for that. Boys things are always harder for me because I have to pipe it down just a little bit so that it doesn't look girly. After doing these I was ready to let loose on a girly outfit :) I will expect a cute picture Beth! I'll get pictures to you soon! I really do love them. Oh, and hang on to some of those fabrics you used on the "Logan" little brother shirt you did for me. Love those fabrics and am thinking I'm going to want some shirts for my boys using those colors.